SP-102 portable runway lights are ICAO compliant aviation lights designed to operate in remote areas. LED optics generates correct light output in terms of intensity and chromaticity. 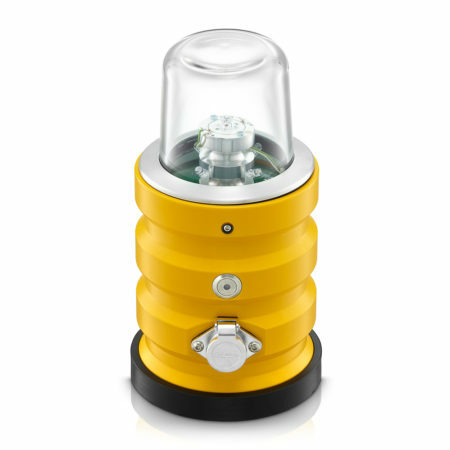 SP-102 airfield light is powered by a standard deep-cycle battery which can be stored locally. We tend to associate airports with grand facilities equipped with plenty of amenities and newest technological solutions. But a lot of airports consists just of a single runway, which sometimes can be gravel of grassy. In such cases, runway edge portable lights are used. Let’s have a closer look at them. First of all, we shall establish when exactly portable lighting is used. Runway edge lighting, just like any other kind of airport lighting, needs to meet an array of requirements, standards and regulations. Primarily, such lighting must meet the ICAO regulations (International Civil Aviation Organization), Annex 14. Moreover, the compatibility with the FAA regulations (Federal Aviation Agency) is also required. For the members of the European Union, the following standards must be obtained: EN 61000-4-2:2009, EN 61000-4-3:2007/A2:2011, PN-EN 61000-4-4:2013-05, and EN 61000-4-6: 2014-04. What characteristics should runway edge portable lighting have? The lights include exchangeable optic warheads. As mentioned before, edge portable lighting can work in different modes. First and foremost, one can adjust the intensity level: minimum, medium and maximum. Moreover, the lights can give out 30, 60 or 120 flashes per minute. Finally, an automatic from-dusk-to-down mode can be chosen. The work time of a light depends on the light intensity. If the light intensity is minimum, a runway edge portable light will work for 25 hours. If the intensity is set to maximum – 10 hours. Some lighting types allow for connecting solar panels. The average charging time would be just 8 hours. A fully-charged battery allows a lamp to work for 36 hours. Portable lighting is often exposed to external conditions influences, including temperatures. A standard lighting can work in temperatures from 20°C to 50°C. However, a lamp set that is often called the “Arctic pack” can work in temperatures from -40°C to 80°C. Runway edge portable lighting can be powered in three different ways. If possible, it is primarily charged with solar panels. If not, a charging station can also be used. Finally, the lights can be powered by the use of an electric power grid. It provides an anti-overcharging and anti-discharging protection. Operating time in steady mode Min intensity 25 hrs.